Ovarian cancer is difficult to detect early because women often don’t feel any symptoms. By the time ovarian cancer is considered, the cancer may already be at an advanced stage, making it harder to treat. 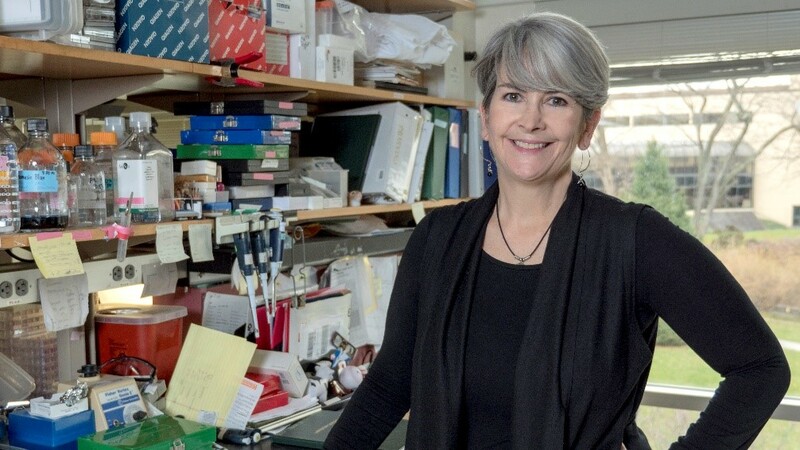 Denise Connolly, PhD, an Associate Professor in the Molecular Therapeutics Program at Fox Chase Cancer Center, and her team are hoping to change this pattern. Armed with a recent donation from the Bucks County Chapter of the Board of Associates at Fox Chase, Connolly and her team are studying how ovarian tumors develop – starting with the fallopian tubes. We spoke with Connolly about her forward-looking research into ovarian cancer. What is the main goal of your research? Our goal is to discover ways to improve the treatment of ovarian cancer. Most cases are diagnosed at an advanced stage when disease has spread beyond the ovary. We want to understand the mechanisms of tumor development and progression so we can better understand the disease and identify potential therapeutic targets. How has the understanding of ovarian cancer changed dramatically in recent years? Cancers of an organ typically resemble the cells from which they arise. When I started in ovarian cancer research 20 years ago, most researchers thought ovarian tumors arose from a single, bland-looking layer of epithelial cells on the surface of the ovary. There is a subtype of ovarian cancer called high-grade serous ovarian carcinoma that is the most commonly diagnosed and clinically significant ovarian tumor type. Although we thought ovarian cancers arose from the surface epithelial cells covering the ovary, serous carcinoma cells more closely resemble normal fallopian tube cells than epithelial cells. This was controversial because fallopian tube cancer was thought to be very rare at the time. In the early 2000’s, researchers who were studying the fallopian tubes from women at high genetic risk of developing ovarian cancer began to closely examined the very ends of the fallopian tube under the microscope and were able to visualize neoplastic lesions, which suggested that cancer could start there. An independent research group also looked at this area and positively identified pre-neoplastic lesions. Because fallopian tube cancers were thought to be very rare, it took years to convince everyone that most high-grade serous carcinomas arise in the fallopian tubes. It was a sea-change in the way we thought about ovarian cancer and it pushed the reset button on the way we do our research. What research will the recent donation your lab received enable you to do? This donation will help us figure out what makes tumor cells migrate to the ovary and why the ovary is so supportive of tumor cells through transgenic models. My lab pioneered the first model that develops spontaneous ovarian carcinomas. This development has led us to many discoveries and also more questions that will hopefully lead us to answers regarding how and where ovarian cancer develops. How could your findings help patients and affect the way ovarian cancer may be managed? Tumors in our models have similar features to high grade serous carcinomas in women. We need to understand how tumors originate and what supports their uncontrolled growth. It is possible that normal pathways become uncontrolled and lead tumor cells to migrate from the fallopian tubes to the ovary. Large fallopian tube tumors are rare in women, so there may be some potential attraction for tumor cells to travel to the ovary. If we can sort out how the disease evolves, we think that will give us ideas of potential molecules and/or pathways to target therapeutically. What do you value most about doing research at Fox Chase? I value the collegial environment and the ability to work so easily with different people. We regularly reach out to other investigators who are always receptive to offering assistance. The ease with which we can connect with our clinical colleagues is incredibly helpful when studying basic science questions—it keeps us grounded in what is important clinically. It is essential to connect our research to what is important in human disease. Read more about the risk factors of ovarian cancer.